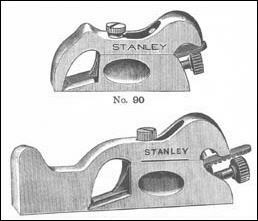 This Stanley Cabinet Makers Rabbet Plane is designed for fine Cabinet or other work where extreme accuracty is required. Both sides of these planes are square with the bottom, and the sides and bottoms are machine ground. The sides and bottom begin square with each other, the plane will lie perfectly flat on either side, and can be used right or left. 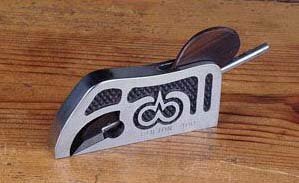 Both the cutter and width of throat opening are adjustable. 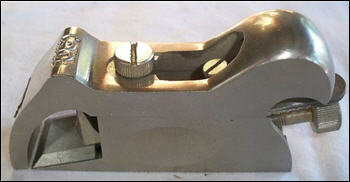 The plane is nickely plated and fitted with the "Hand-Y" feature which is the indented grip milled into the side of the planes. This allows a more comfortable grip. These planes are designed to be used either left or right handed. The width of the throat opening or mouth is adjustable so that it can be widened or narrowed as coarse or fine work may require. Stanley No. 90. Bull-Nose Rabbet Plant, 4 inches long x 1 inch wide with a 1 inch cutter. Because of the very short toe section, about 1/4 inch, it is good for bull nose work. Stanley No. 92. Rabbet Plane. 5 1/2 inches long x 3/4 inches wide, 3/4 inch cutter. The sole of each plane is in two parts, one which forms the toe of the sole, and the other which forms the heel of the sole. As can be seen in the photos, the toe section slides over the top of the heel section. They are attached by means of the large slotted screw at the top of the tow section. The planes mouth is adjusted by loosening the screw and sliding the tow forward or backward over the heel and then tightening the screw. The toe section can be removed completely so the plane can be used as a chisel plane. Rear view of the Stanley No. 90 Cabinet Makers Rabbet Plane showing the heel section that fits the palm of the hand. 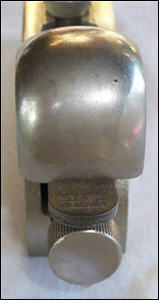 Patent for the Hand-y feature in a planes body, a milled indentation that made the plane easier to grip. 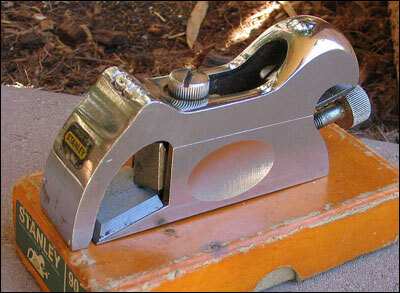 Clifton Tooling continues to create some of the finest steel rabbeting planes available. These finely crafted tools feature carefully machined and polished castings with very narrow throat openings for absolutely minimal tearout. Though these planes are likely to become even more valuable as collectors' items, their functional beauty will earn them a place in many a well-equipped hand tool shop. Model 400 is an exquisite little bullnose rebate plane, 7/16" x 3-1/4" long, weighing just 5-1/2 oz. Its iron is held in place by a rosewood wedge, adjusted by hammer.